This house built in the 1990s had shown evidence of foundation settlement with cracks and gaps as wide as 1-1/2 inches which is a clear call for foundation underpinning. To prevent further settlement and fix the existing condition of the foundation, Solid Earth Technologies, Inc. used an underpinning method by installing eight helical piles that ranged on average of 20' deep on the exterior portion of the foundation. 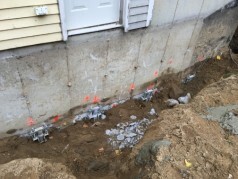 This application successfully closed the gaps and stabilized the foundation to its original state. If you have a house or structure that can use foundation underpinning, please use our form to contact one of our helical pier installation specialists.